The last time I heard my mom's voice, she was cussing me out on my voicemail. I hadn't heard it for a few months prior at that point — I was in the middle of my third or fourth attempt to stop talking to my mother, and I'd made a practice of not listening to her hurtful voice messages, reading her emails, or opening her letters. Just overhearing the muffled sound of her agitated voice, as my boyfriend listened to the voicemail for me, was enough to ruin my day. But it also helped me confirm that not talking to my mother was still the right decision for me. If you're reading this, then know that not talking to a parent or other family member might be the right choice for you, too. Maybe you're an old hand at not talking (or going "no contact," as it is sometimes called). Maybe you just stopped talking to a toxic parent yesterday. Or maybe you're just beginning to consider the idea that limiting your contact with a family member who manipulates, guilts, or otherwise emotionally harms you might make life better. No matter what phase you're in, you've likely received a lot of pushback, both from your parent and the world at large, about your decisions. Friends might be confused, or even tell you that you're selfish ( a sentiment that the toxic family member whom you've disconnected from has almost definitely seconded). And the judgment doesn't stop with people you know. If you Google the phrase "not talking to my parents," you'll primarily find resources aimed at soothing parents who have been cut off — or, at the very least, aimed at shaming children who did the cutting off. Most major articles about kids who are estranged from their parents, like this 2012 article from AARP, take the parent's side, accepting their confusion about why their child cut off contact at face value, and judging the child for being self-absorbed. To use some extremely serious journalistic terminology right now: uh, no. If you've stopped talking to a parent, it's probably a struggle every day to keep doing it. But you shouldn't feel guilty or bad about the decision, should you make it. Odds are that you didn't come to this decision lightly. Despite what many "experts" would have you believe, we actually live in a world that makes it as difficult as possible to cut off communication with a family member, especially a parent. So actually taking this step probably means that your relationship with your parent was so toxic that you felt like you had no other option. Of course, some people will be unable to believe this. They legitimately can't imagine anything "bad enough" to cause someone to stop speaking to a family member. But that's OK. Your life is not limited by what your friends, co-workers, or other family members can imagine. Your choices don't have to be relatable to your roommate or best friend in order to be right for you. You're the one who knows exactly how interacting with this family member hurts you. You're the only one who has to live with the aftershocks of maintaining this relationship, and so you're the only one whose experience matters when deciding what to do. While you may feel like you're the only person on earth who's had to deal with something like this, you're not. And while a quick Google may primarily reveal materials aimed at parents who have been cut off, the Internet is actually chock-full of support communities for folks with toxic parents, including those who have broken contact with them. I've personally found Reddit's raisedbynarcissists community to be a godsend — just reading posts by people who have had the kind of experiences that were once a part of my daily life with my mother (but are beyond the wildest reaches of most of my friends' imaginations) really helps me, and reminds me that I've made the right choice. There are great books out there on this subject, too — the recent Mothers Who Can't Love by Susan Forward (who also wrote the classic self-help volume Toxic Parents) was immensely helpful for me. There are also tons of great personal essays out there about being estranged from parents, which can help you feel comforted and understood. I recently read an excellent one by Katja Bak on Medium; the takeaway beautifully distilled the struggle of the estranged child: "It’s okay to let go of your family. Society tells us that family is number one in your life — they come first ... They would do anything for you, and you would do anything for them. It’s not always the case. The truth is, they are just people. They are not infallible. They are not perfect. They can be bad, and cruel, and toxic — despite being your blood. And it’s okay to walk away. It’s okay. It is okay." Emotionally abusive or manipulative parents often make a practice of constantly questioning their child's reality and experiences. Our childhoods were full of moments of being told that problematic parental behavior "never happened," that a problem our parent created doesn't matter because they "did the best they could," or that an event that traumatized us "didn't happen like that." Telling someone that the things they remember didn't happen is a tool of emotional control called "gaslighting" — and a lot of people who cut off contact with their parents have been gaslighted so hard and for so long that they barely have a handle on reality sometimes. In my own life, my mother and I were the only people in our home, and thus, all our conflicts were her word against mine. When my word conflicted with hers, she went to great efforts to proclaim that my memory was cloudy or that I was a liar — to the point where today, at 33, I barely trust my own memory of where I left my keys, let alone my memories of interacting with other human beings. As you can imagine, trusting my memory of my mother's hurtful behavior was pretty difficult. But I got there eventually. 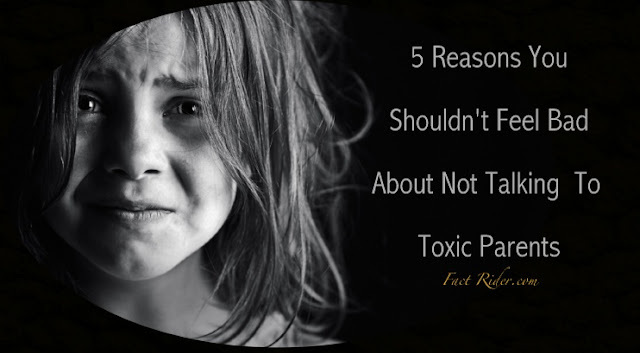 Not all children who have toxic parents were gaslighted, but many were. Your parents may have done it on purpose, or they may have done it simply because they had mental health issues or other problems that kept them from being able to empathize with you or see any perspective besides their own. But your experiences are real. Just because your parents claim that they "did the best they could" doesn't mean that they actually did — and even if they did, the fact that they did their best doesn't mean that you are obligated to be emotionally wounded by them for the rest of their life. You know best how your relationship with your parents impacts your life. The idea that pushing away your family means that no one will ever love or support you is a common threat used against children who are trying to cut off contact, but it is very, very untrue. If anything, ending a relationship with a toxic parent (and the toxic love that they provide) may give you an opening in your life to accept genuine love and support for the first time. In my own life, my mother's love had a stranglehold on me; she regularly made sure to do everything she could to sabotage my friendships, romances, and professional relationships. Despite her threats that no one would ever care about me besides her, I found that building a life apart from her allowed me to find a real network of friends, and a truly loving boyfriend, for the first time. Your new support system can be anyone — a "chosen family" of friends, a partner, members of an online or real-life support group, a sympathetic and understanding therapist — as long as they get it. And you will find someone who gets it. A good therapist, in particular, is trained to understand things about human relationships and families that might be hard for other people to hear, so they can be a great place to start when building your support network. But remember: You're not crazy for feeling this way, and someone else is going to understand. This may be a good thing — your parents are willing to try to develop a healthy relationship! Hooray! Or it may be a bad thing (i.e. you initiate contact because you miss them, and end up opening every wound you've healed in your time of no contact). But not talking to a parent does not often last forever. You can use this to soothe yourself if you feel bad about it, but you should also keep it in mind if you initiate contact and end up regretting it. Wanting to be in contact with a parent is a very natural urge, and you shouldn't blame yourself if this urge motivates you to do something that is ultimately bad for you. Though I've been actively putting distance between my mother and myself for nearly a decade, I've also re-initiated contact with her a number of times — because I was worried about her health, because I felt lonely, because I wanted to see our aging family dog. Yes, things got out of control almost immediately every time, and I regretted reaching out, but we need to be easy on ourselves when stuff like this happens. It's not your fault for hoping or wanting — and it's also not a mark against you if it doesn't work out. So remember, no matter what, that you're not nuts and you're not alone. No one — not even the people who birthed you — are automatically entitled to your time or energy if they hurt you. I can really feel the deep disposition you are at right now after reading this. All i can say is that there's no perfect parent nor a perfect child". And as to the nature of the dilemma we are in, we ourselves alone are the best judge. At time like this when cutting off communication is necessary but should be hoping for that reconciliation soon. Because after all, families are families and there's no breaking of that bond. I hope you find peace and soon reconcile with you parents.